We have several products that will control a wide range of insects but the one of most concern is the MOSQUITO due to its reputation and ability to carry and transmit diseases, most notably "West Nile Virus (NWv)". Other diseases include: Malaria, Ross River, Dengue Fever and now Japanese Encephalitis. There are three ways to protect yourself against mosquitoes and other insects. Insects are attracted to the U.V. black light then forced down by a powerful internal fan into the reservoir mixture containing a couple of drops of biodegradable dishwashing liquid and water, causing them to drown. Bloodsucking insects bite to get blood from their victims as a necessary process in reproduction. The biting insect (the female) is attracted by carbon dioxide, pheromones, heat, smell, as well as light. Research has shown a light that emits across the UV spectrum is extremely efficient in attracting most flying insects. The male mosquito is a particular case in point. 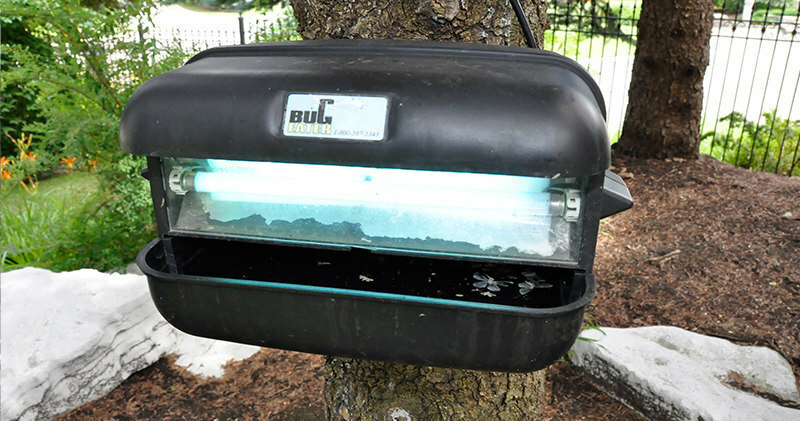 By targeting the male using UV light, Bug Killer Pro breaks the breeding cycle after only 21 days, eradicating the insects from the targeted area. NO Males! NO Reproduction! NO New Mosquitoes! Where should "Bug Killer Pro" be installed? Use within 10-15 meters/30-50 feet of where you want control but not directly in the area of use. It should be approximately 0-2 meters/0-6 feet off the ground. Light should be visible (not obstructed by vegetation) to the area in which control is desired. During the first 3 weeks it is highly recommended that 2 attractants be used. These will assist in luring all mosquitoes - male and female - to the trap. Lactic Liquid - simulates the lactic acid the body produces through the sweat glands. It is suggested that these two attractants be used consistently for maximum effectiveness of Bug Killer Pro.